Ultrasonic Vehicular Odor Extraction & Sanitizing Service and DIY! 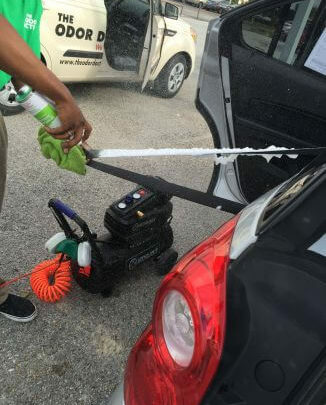 Our proven odor-sanitization surface treatment technology completely removes unpleasant smells using a unique treatment method that is easily applied to fleets, vehicles for sale and any other interior area. Make sure that customers, guests and employees experience only what is intended and nothing else! Eliminate odors, don’t just cover them up! Rid your car of odors from smoke, food, bacteria, mold & pet odors. Customers can always tell the difference. Read how we completely eliminate vehicle odors including smoke, pets, body odor and more! A bad odor, especially smoke, can impact the trade value of a vehicle by several hundred dollars, particularly on high end vehicles. We use a unique method of sanitizing called “Saturated Dry Steam Cleaning“. It’s fast, disinfects, kills bacteria, neutralizes odors, doesn’t use harsh chemicals, and is eco-friendly! Dealers Only, this kit contains everything you need to deodorize and sanitize 12 vehicles. Want to Partner with The Odor Doctors? See the latest news with The Odor Doctors. The Odor Doctors is the only thing that really works! We had a sixty thousand dollar Chevrolet Suburban with a mouse trapped and dead in the vents. We tried every possible way to remove the stink. No success. I remembered, call The Odor Doctors! We’ve never had an experience with odor that The Odor Doctors could not remove.